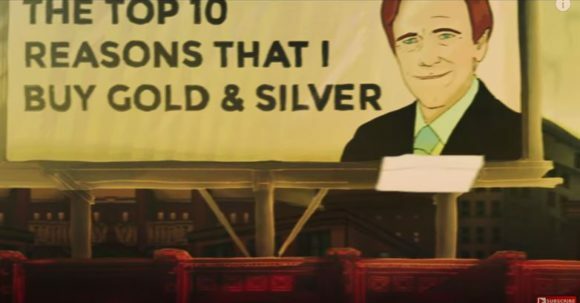 In this video Mike Maloney lists 10 reasons why HE buys gold and silver. Mike Maloney is a financial historian and educator. I talked about him here. He believes in gold and silver and known for his best-selling book “Guide to Investing in Gold and Silver”. Actually, now you can download his book for free (thanks Michael). Go here. Below I summarize those reasons. 10. All the world’s currencies are fiat. And all fiat currencies always fail. The overall majority of people – 99.9% – are unaware that we no longer use money. What we call ‘money’ is actually fiat currencies. US dollar, Canadian dollar, rubles, franks are all fiat currencies. Fiat currencies do no hold any real value and are not backed up by anything of value. They are not gold, silver or land. The governments just declare that US dollar or British pound, for example, have value. And as long as common people like me and you believe in that, fiat currencies can function as a medium of exchange or ‘money’. The moment this belief is overthrown by majority, dollars, franks and rubles become just paper (only valuable to start a fire 😉 ). Many fiat currencies existed in the past and all failed 100% of the time later or earlier. That happens because whenever people sense that their currency can longer buy them what it used to earlier (inflation), they lose trust in it. The devaluing of currency is inevitable since the more currency is created, the more its value is diluted. And the very thing that defines the FIAT currency is that it can be created in unlimited amounts. Now, in the past some nations had fiat currency, while others at the same time period had gold and silver coin. But today it’s different. Today we live in the unique period of human history because since 1971 ALL currencies are fiat. This never happened in the past in all countries simultaneously. the new reserve currency, or better said monetary system is soon to hit stage. It’s on the edge. The fiat currency system can’t continue forever and, hence, financial bubbles can’t inflate indefinitely. If you carefully observe the past, you will see that the governments always oscillate between quantity money to quantity currency. From quantity money to quantity currency and back to quantity money and then the cycle repeats over and over again. That’s how money tend to behave on the historical scale and that’s what Michael was able to see when studying the history of money. Michael shares the pattern he observed here. As you can guess, a good example of quality money is gold coins. And quantity currency is another term for fiat currency as it can be created virtually in unlimited amounts. So, an example of quantity currency is, again, the contemporary US dollar. But once the US dollar falls, the other currencies tied to it will too, and that’s when the governments will return to the stuff that always worked – gold and silver. Also, when the dollar falls, gold and silver will rise in value exponentially. This is when the transfer of wealth will happen. Whoever owns gold and silver will reap the benefits from the shift. This point is very similar to #10. In the last 100 years we had four different monetary systems (1922, 1944, 1971). Since 1971 we are on the US dollar standard (47 years). Given that every 30-40 years there is a new monetary system and the US dollar has been reaching its limits, the conditions for a new monetary system have been met. That means that over the last decades central banks have proved themselves than printing currency doesn’t fix things permanently. Although they may try to fix the coming crisis once again with quantitative easing measures (massive currency printing ), when they reach point of no return, the currency will crisis set in, and that’s when they will start thinking about turning to time-proved financial system – gold and silver. Listen why Michael thinks that bonds, stock, and even real estate are not smart things to invest in! Markets are driven by greed and fear. Greed is engine for creating new currency (quantitative easing), rising prices, and hence, financial bubbles. In times of serious economic roller coasters, fear sets, and that’s when investors and central banks abandon currency and return to medium of exchange that always worked before – gold and silver. In the 1970s the precious metal market was vastly different from the precious metal market today. In 1970s there were only two exchanges that set the price of gold (in US and England). So, at the time only US and Western Europe could participate in the gold rush. Today, central banks and private investors all around the world own gold (and obviously, there are numerous exchanges). So, today, the whole planet can participate in the gold and silver rush. An ounce of gold could cloth a man from head to toe in Ancient Rome AND today. So, an ounce of gold today has relatively the same purchasing power as it had 2000 years ago. But here is a curious thing. The time it takes to make the stuff that would fully cloth a man shrunk from several months to a few hours. So, why can’t you buy more suits with one ounce of gold if the price of the man’s outfit shrunk? Michael Maloney explains it this way. Today, in addition to gold, there are bonds, stocks, and real estate, which move gold from the pedestal diluting the purchasing power of gold. Anyways, although the purchasing power of gold was not always constant, gold was always worth something. However, once the fiat system fails, the real estate, bond, and stock bubbles will pop, skyrocketing the price of gold. Michael also adds “I buy both, gold and silver, but I buy mostly silver”. That’s because silver today is severely underpriced. Deficit spending, government debt, bond, stock and real estate bubbles have inflated to lethal levels. As a result, today there is 200 times more wealth stored in these assets than in gold. If only 10% of non-precious-metal wealth is transferred to gold, the price of gold will rise 20 fold. But Michael believes that in the coming crisis it will be a lot more than 10%. That’s because when the serious crisis sets in, fear set in. And in times of crisis fear is what drives investors, not greed. And the only remedy for this fear is gold and silver. Never before the countries around the world had laid such a perfect scenario for the global financial storm. He believes that fiat currency crisis will cause stock, bond, and real estate bubbles to burst simultaneously. This will result in the greatest wealth transfer in history which can either impoverish you, or if you own gold and silver, enrich you beyond your wildest fantasies. Hopefully, the above made summary easier to understand what Michael is talking about. If the video or the above summary didn’t make much sense, I suggest you watch Michael’s Maloney’s ‘Hidden Secrets Of Money’ series. His videos are engaging and they will help you glue the pieces together and see the big picture. ← Karatbars Open Its Own Exchange – Karatbit!